Welcome to Van Gogh Class! 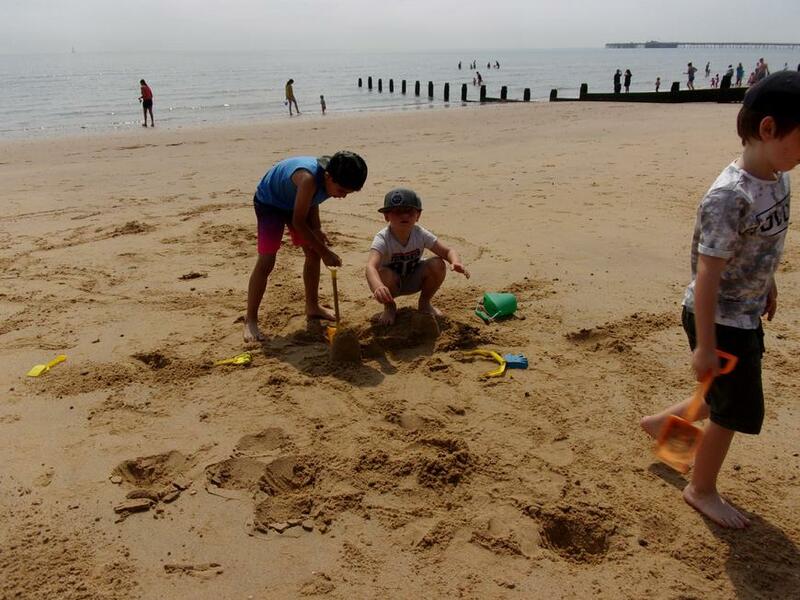 We hope you enjoy seeing our fantastic learning in year 2! For World Wildlife Day Mrs. Bond shared with us some information about the problem of plastic pollution. This inspired us to write key messages to our local MP Mark Prisk with suggestions about how we can protect our amazing oceans. 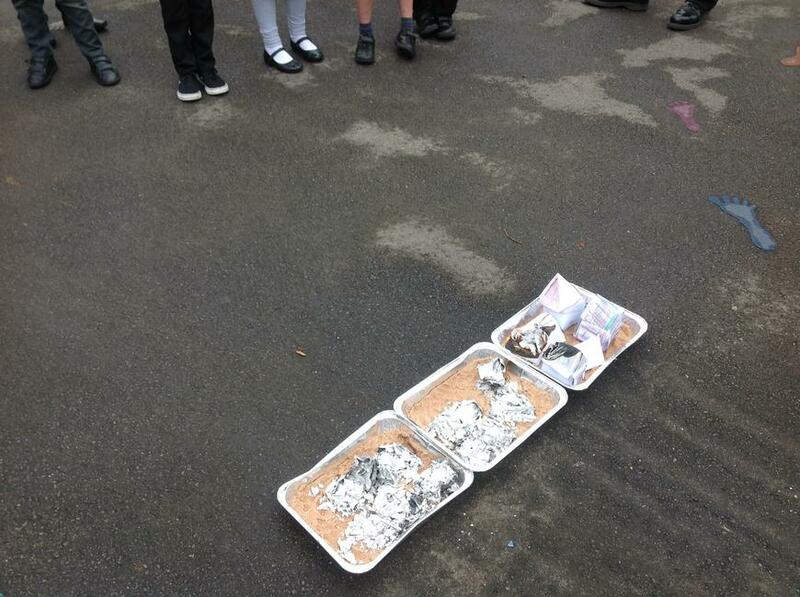 In Science Week we explored space! 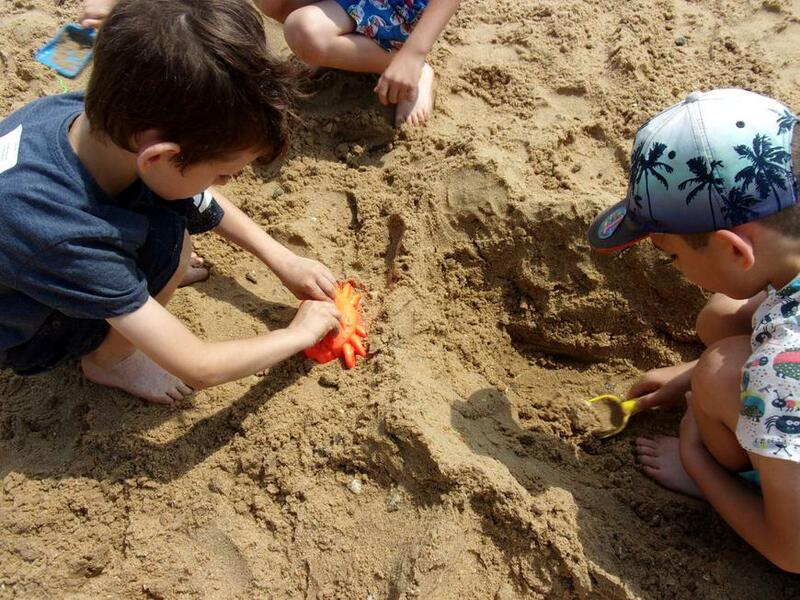 We began by creating our own rovers and testing the most effective types of wheels for different surfaces. Next, we used Mini Grey's 'Space Dog' to create our own exciting Astrocat and Mousetronaut adventure! 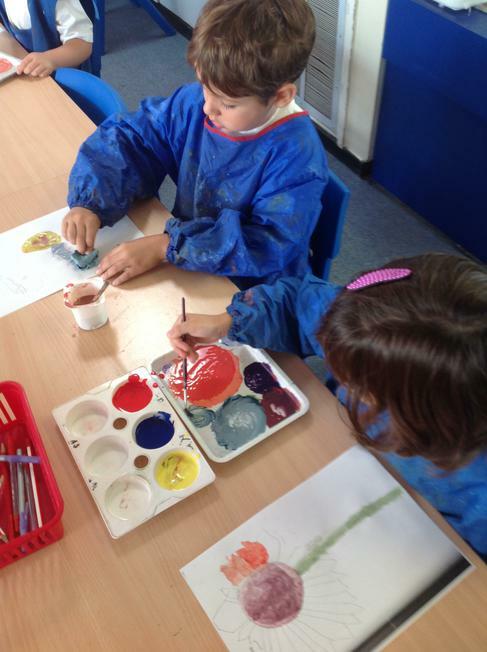 We applied our observational skills to look closely at Jupiter's red spot and create some fantastic pastel drawings. Finally, we used card and torches to create different star constellations. 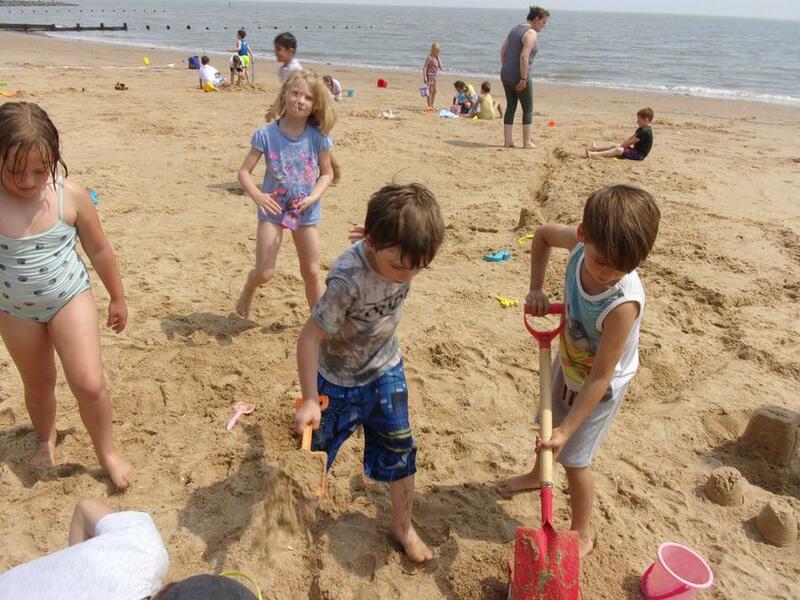 For the competition, we designed and built incredible rockets from recycled materials. We all enjoyed sharing our favourite books and book characters with our friends on Thursday 7th March. 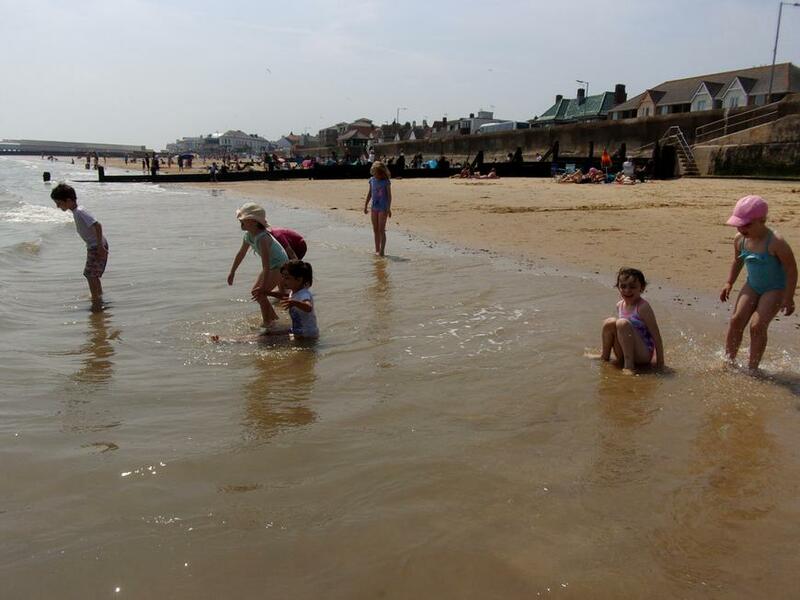 We began our new topic with an exciting journey to Australia. First, Miss Raw stamped our passports and showed us to our flight. We had a long journey, travelling for a whole day! When we arrived in Sydney, we journeyed north to the Great Barrier Reef and swam with clown fish and seahorse! We watched a traditional aboriginal dance and saw a didgeridoo! Finally, we went on a wildlife walk, colouring pictures of Australia's fantastically strange animals! 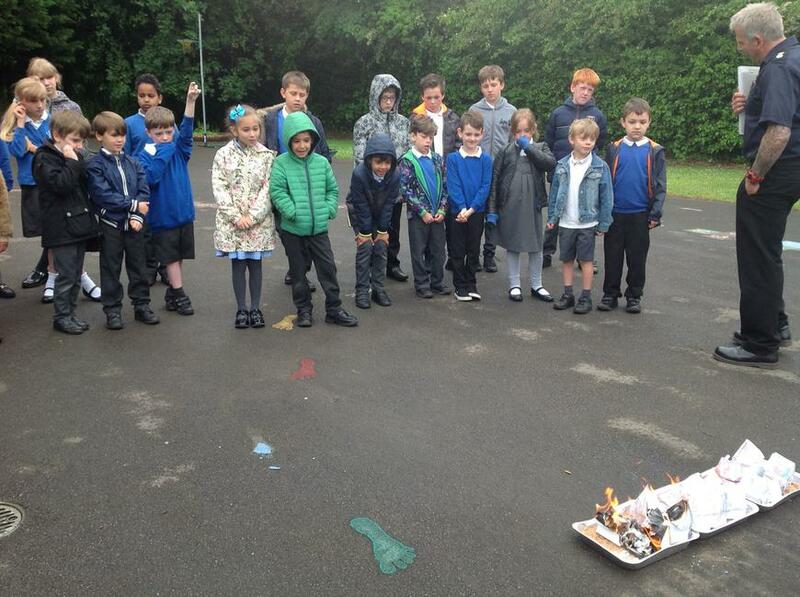 We celebrated 'Feeling Good' week with some outdoor learning, creating models and pictures from natural materials. We also listened to a story called 'Have you filled a bucket today?' by Carol McCloud. This inspired us to create our own buckets to fill with positive messages to others! 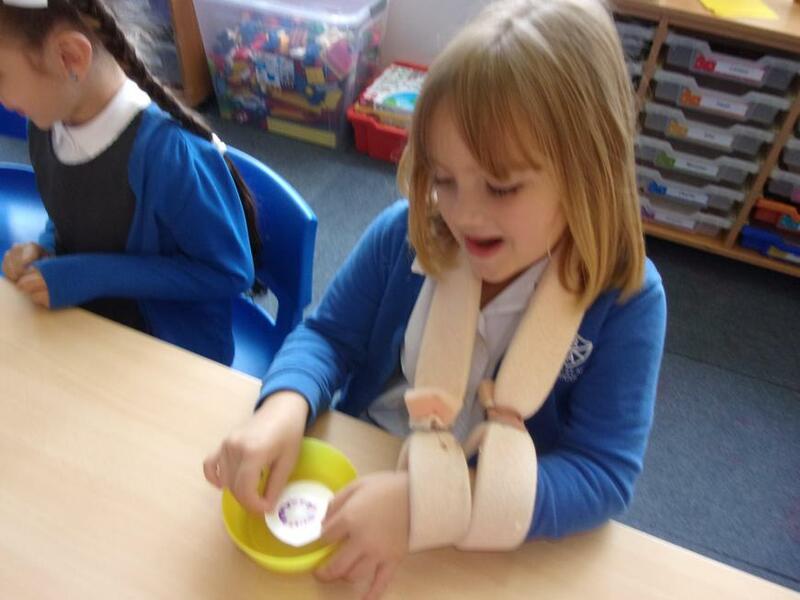 We enjoy being bucket fillers in Year 2! During E-safety week we thought hard about how to use the internet safely so that we can all enjoy it. 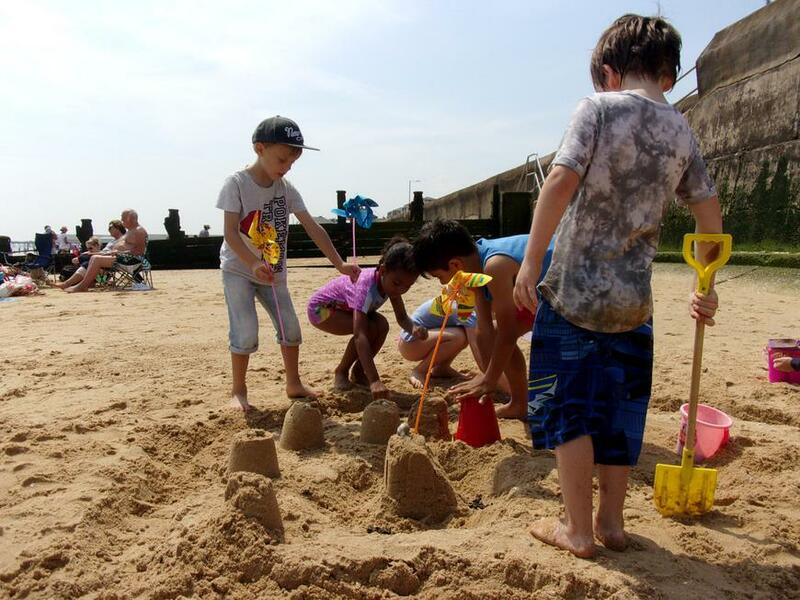 We came up with some top tips to help other children stay safe online. 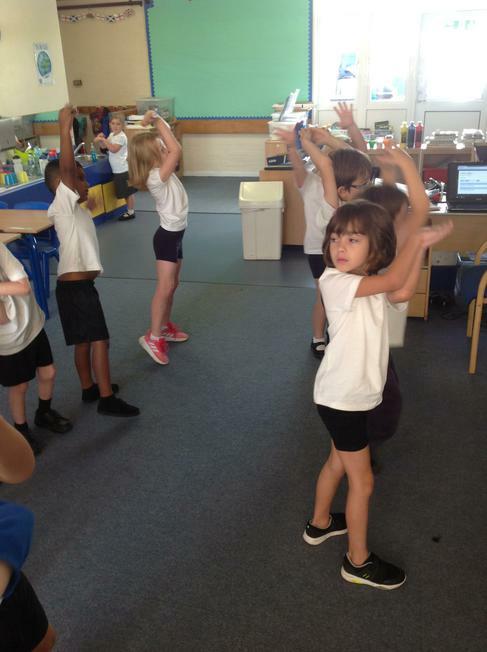 In Music we have been practising the Tanzanian game song 'Simama Kaa'. We followed the score to tap, clap and pat rhythms to accompany the words. Tru created her own pattern and David was great at staying in time. We have started looking at hot and cold places around the world. 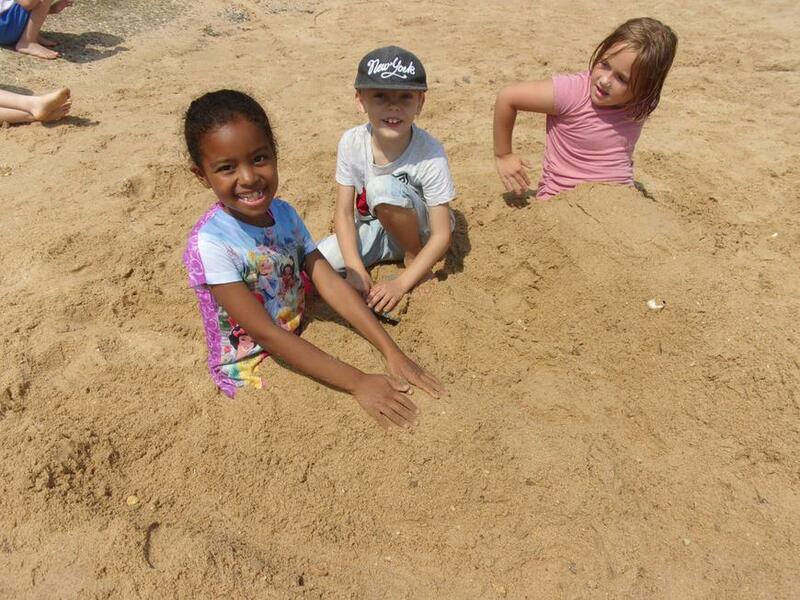 Junior and Freya told us that it is warmer around the equator. We created a key and coloured maps to show the different climates. We then thought about the types of clothing we would need to pack for a cold or a hot climate zone. Andrew listened carefully to the non-fiction text and added lots of layers for a cold climate and loose clothes for a hot climate. In gymnastics we have been learning about point and patch balances. Point balances are on small areas of our body like hands and feet and patch balances are on larger parts like our tummy and shoulders. We held some very creative balances for 3 seconds and then worked with a partner to create a balance with a number of points of contact with the floor. Year 2 combined their IPC and maths learning to order the wing span of planes from the shortest to the longest. 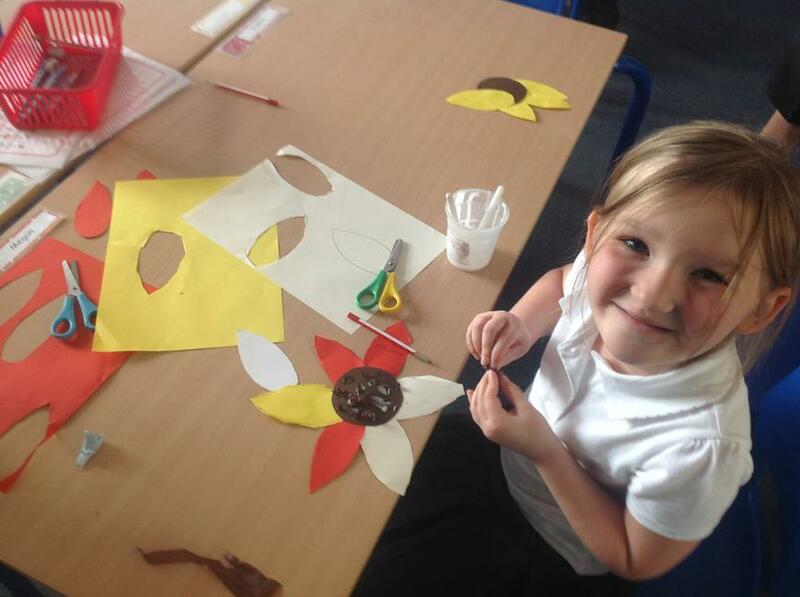 On Friday 30th November we celebrated St. Andrew's Day by creating some fantastic thistles and having our very own caleigh! We also looked at St. Andrew and traditional celebrations for the day. "Andrew helped people fight" - Nathan (Some believe that St. Andrew appeared to the Scottish king promising him victory in battle). Look at the fantastic machines we created as alternative forms of transport to a plane! 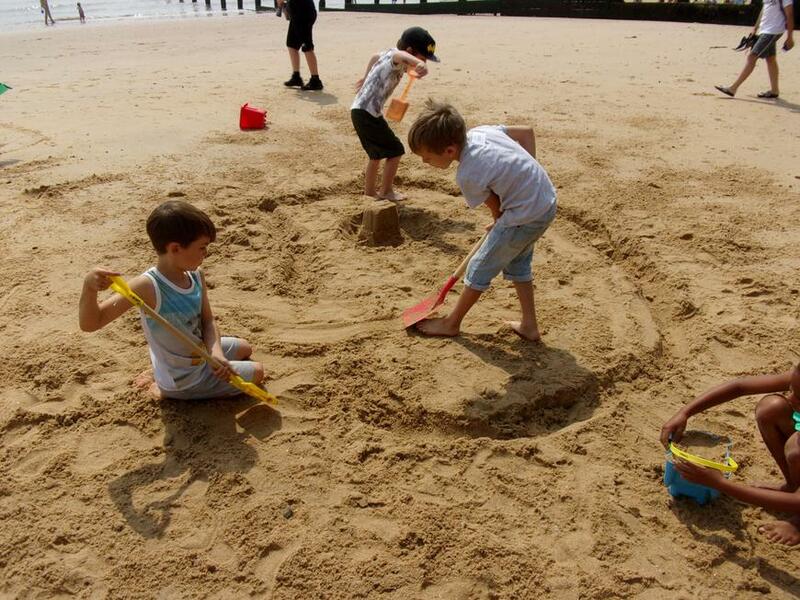 KS1 follow in the footsteps of the Wright brothers! On Tuesday 20th November we were visited by Robin, who is a pilot and STEM ambassador. He gave us a super presentation about his job and the amazing things he has seen, although we didn't like the idea of flying above volcanoes! Next we folded our own paper aeroplanes and decorated them. We flew them in the hall, recreating Kitty Hawk and the amazing achievements of the Wright brothers. Finally, we ended the afternoon with a quiz about Wilbur and Orville. As you can see, we really enjoyed ourselves! This year's theme was choose respect! We wrote positive comments about other children in the class before creating some key messages about how we can show respect. We had a fantastic time exploring India through the story 'Jamil's Clever Cat' by Fiona French. 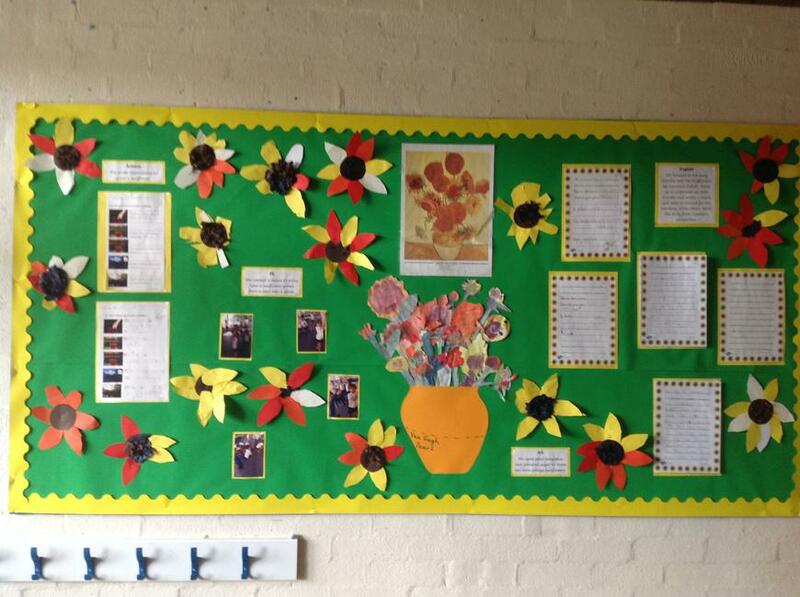 Come and see what we did on our super corridor display! If you want to make your own delicious Indian mango lassi, here is the recipe! 1) Mix the yogurt, milk, sugar and mango pulp together in a bowl until it has all combined. 2) Chill the drink in the fridge for about 20 minutes. This recipe will serve 4-6 people. We applied our learning about the importance of different types of foods and their benefits to our bodies by designing and making our own delicious sandwiches! In DT we have been learning about notebooks, paper and how they are made. We used a mold and deckle and multicoloured paper pulp to create our own handmade paper for notebooks. 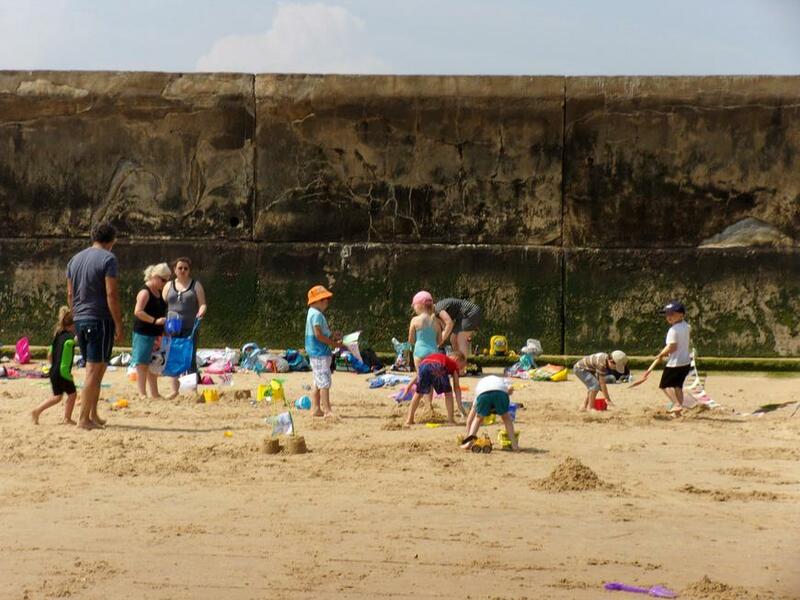 As you can see, it was messy but lots of fun! We had a fantastic active morning at Wodson taking part in a carousel of sports activities. We pretended that we were William Caxton. First we wrote out a letter as many times as we could in one minute, like William when he copied out books by hand. Then we took a stamper to see how many times we could make a mark in one minute, like William when he used the printing press to make books. We agreed that a printing press would have made making books a lot quicker! In science we are learning about growth and survival in living things. 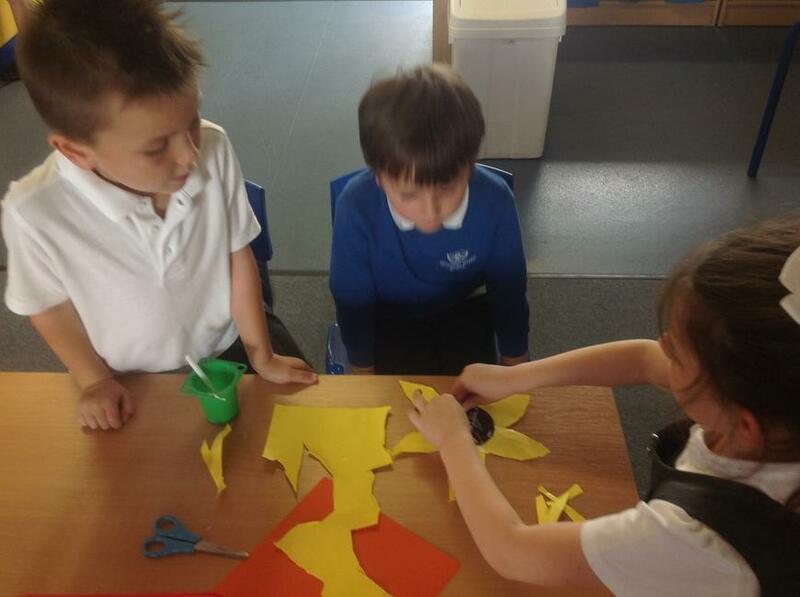 We worked in groups to make models of life cycles for owls, butterflies, penguins, spiders and frogs. We are practising our throwing and catching skills with Mr Whitaker in our Friday PE lessons. 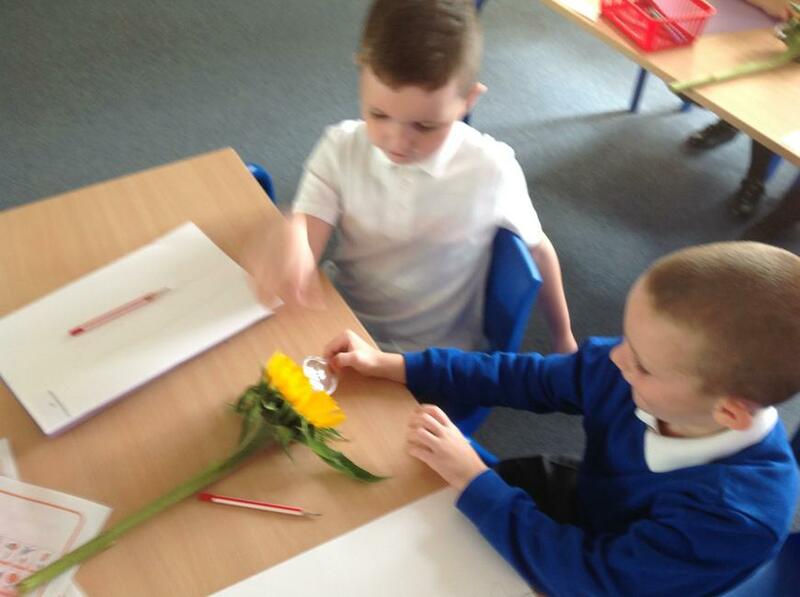 Year 2 started the term by looking at Van Gogh's painting 'The Sunflowers'. 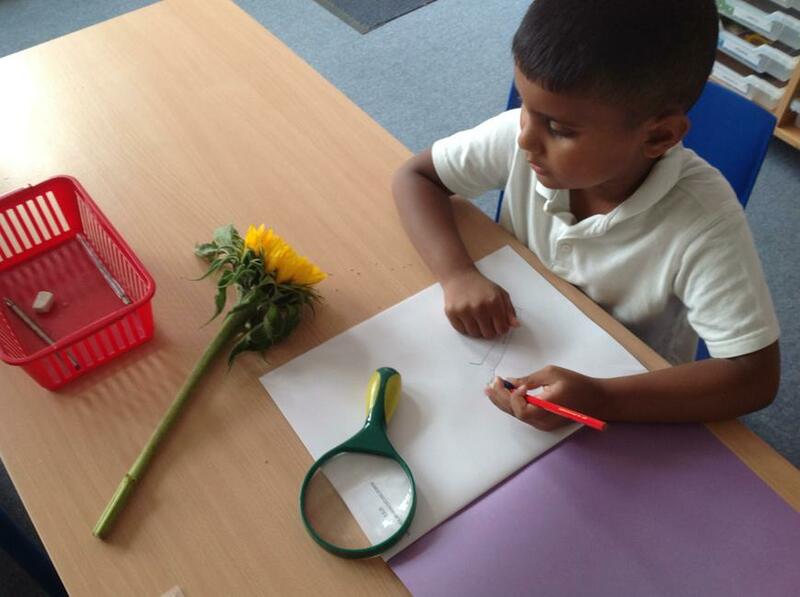 Using the story 'Camille and the Sunflowers' by Laurence Anholt they produced some excellent pieces of writing from the perspective of the little boy who meets Vincent and gives him a present of golden sunflowers. 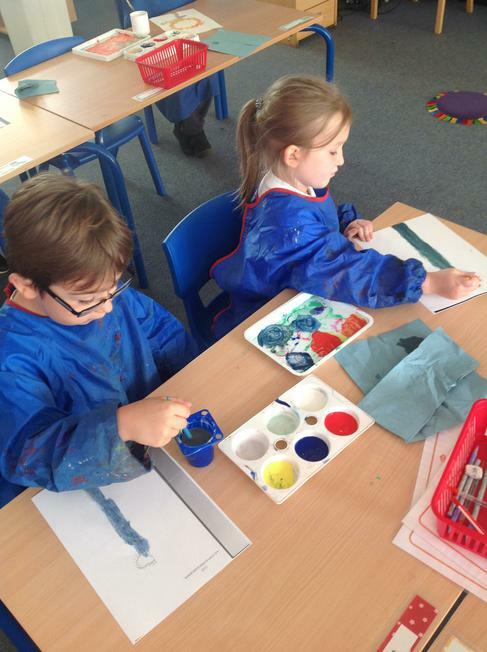 In art they used their observational drawing skills to sketch sunflowers and then enjoyed mixing primary colours to paint their pictures. 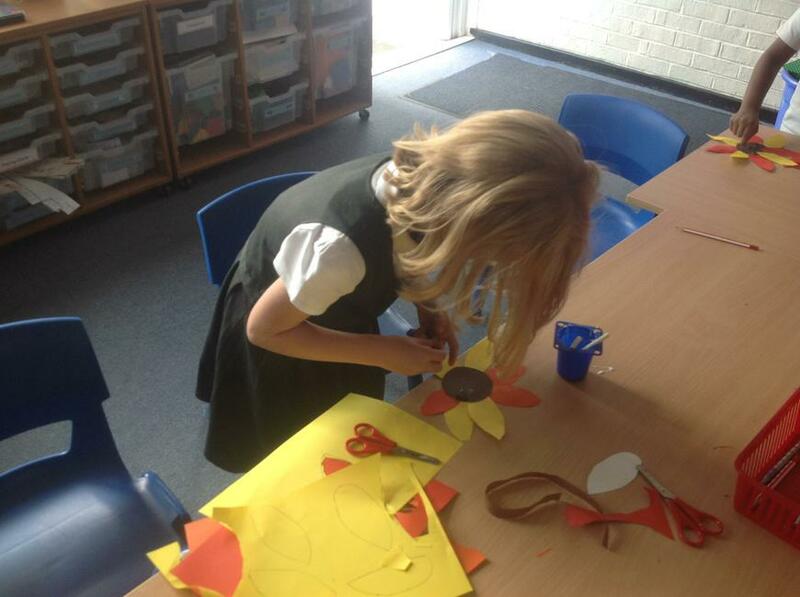 They also used collage skills and paper templates to create some wonderful textured sunflowers. 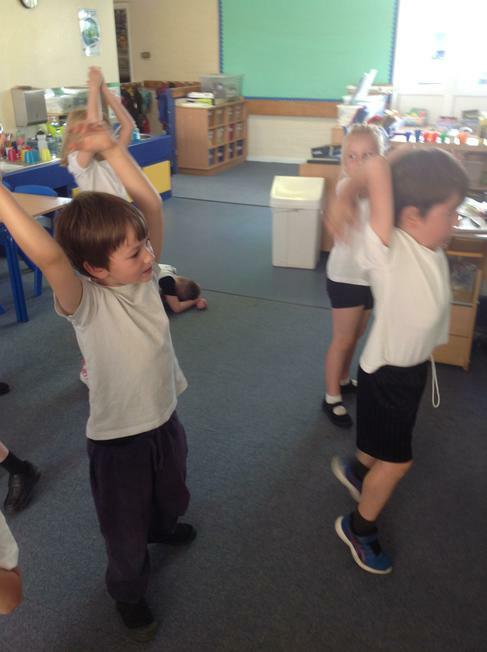 Finally in dance, the children pretended they were a sunflower seed and told the story of the sunflower's life cycle to some exciting music! We applied our running stitch skills to create these amazing Punch and Judy puppets! After completing our puppets with decoration we evaluated them to explain what we were proud of and what we could do to make them even better. Stanley - "I am proud of my design and my character. I could make my puppet even better by adding more colours." Noah - "I am proud of my teeth and claws. 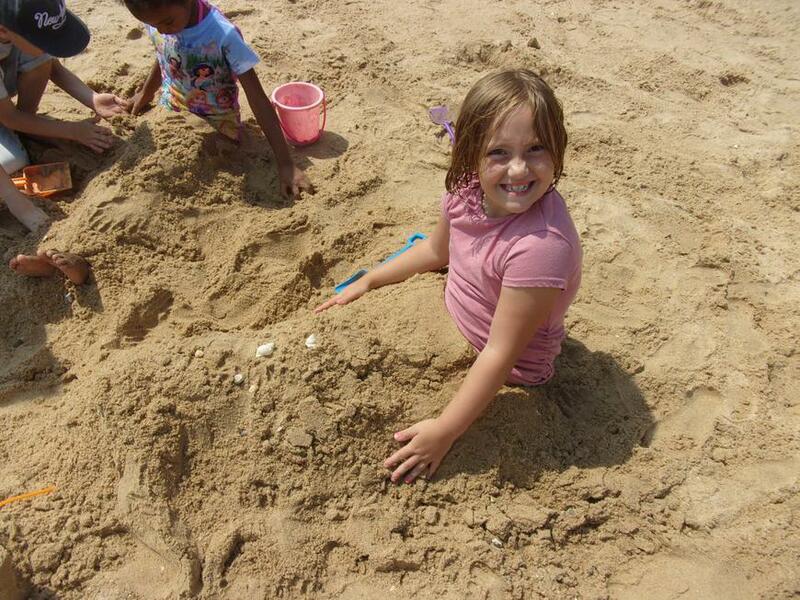 I could make my puppet even better by my tummy being a bit bigger." Miss Raw gave us a certain number of Play-Doh balls and straws of different lengths and asked if we could work out which 3D shape they would make. We found out that 8 long straws and 5 ball of Play-Doh make a pyramid and short and long straws can create a cuboid. We are going to create our own 'Punch and Judy' puppets in Design and Technology this half term. We started our learning today by looking at some real puppets and how you can make them move. 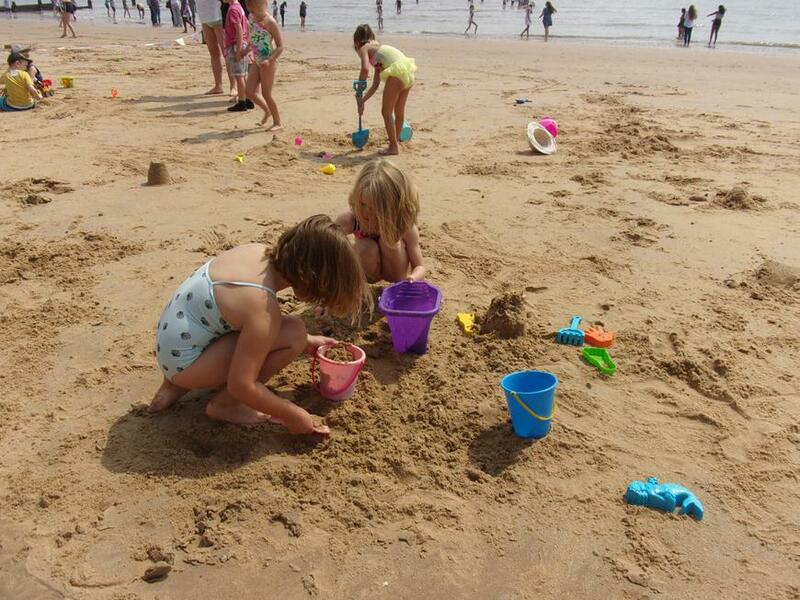 We used google earth to locate seaside holiday destinations and then mark these onto a map. We have learnt a Tanzanian game song called Simama kaa. We enjoyed singing in Swahili and performing the actions to match! 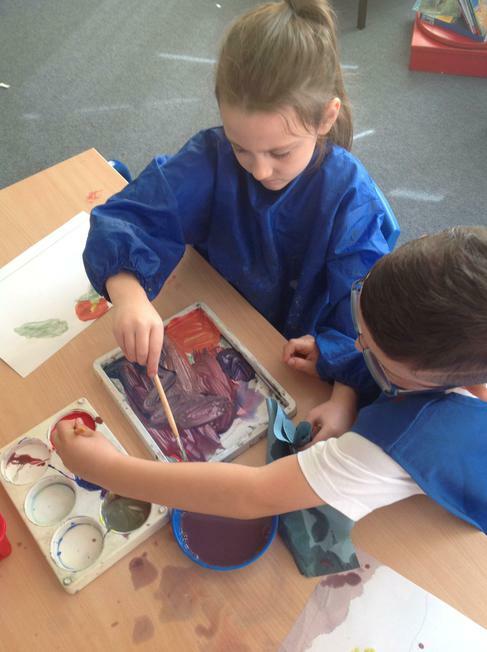 In art we have been learning about stencils and block printing. We created stencils of famous buildings in London, such as the Shard and the Tower of London, and used sponges to print these onto black card. 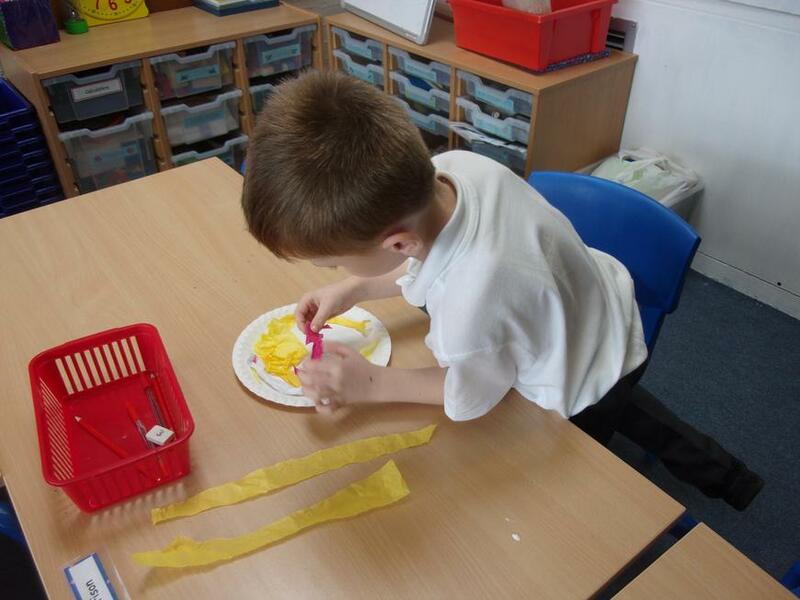 We then used pattern blocks made with string to add texture to our images. 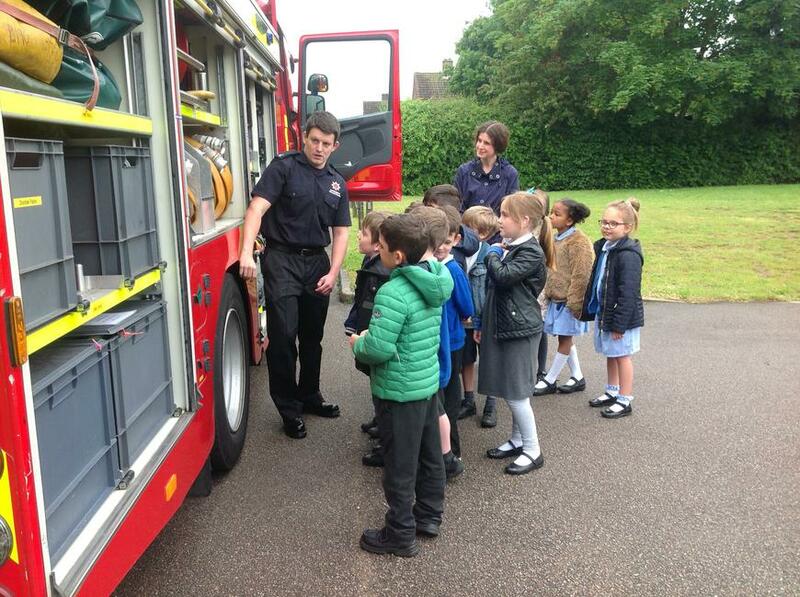 We completed our learning about the Great Fire of London with an exciting visit from Hertford Fire Service. 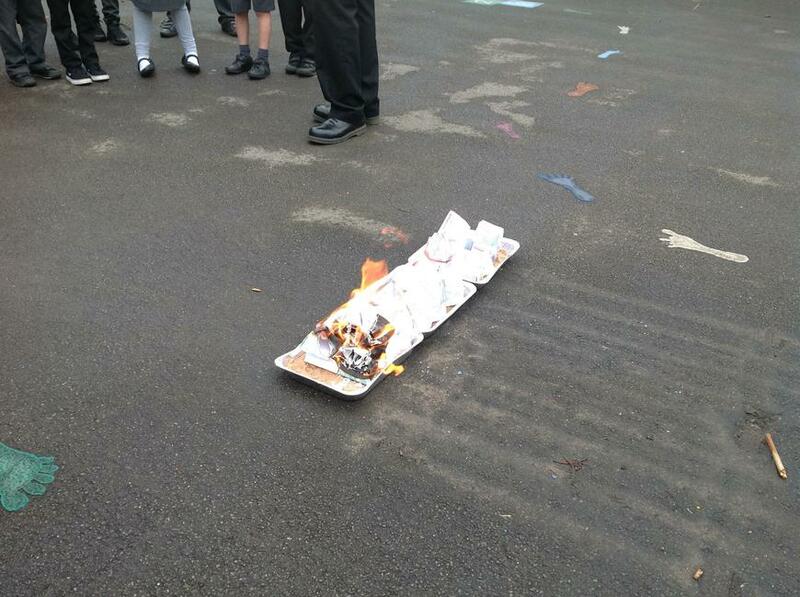 Mr. Moore set our card models of 17th century houses alight and we watched with a mixture of fascination and horror as the fire quickly spread and destroyed the houses! 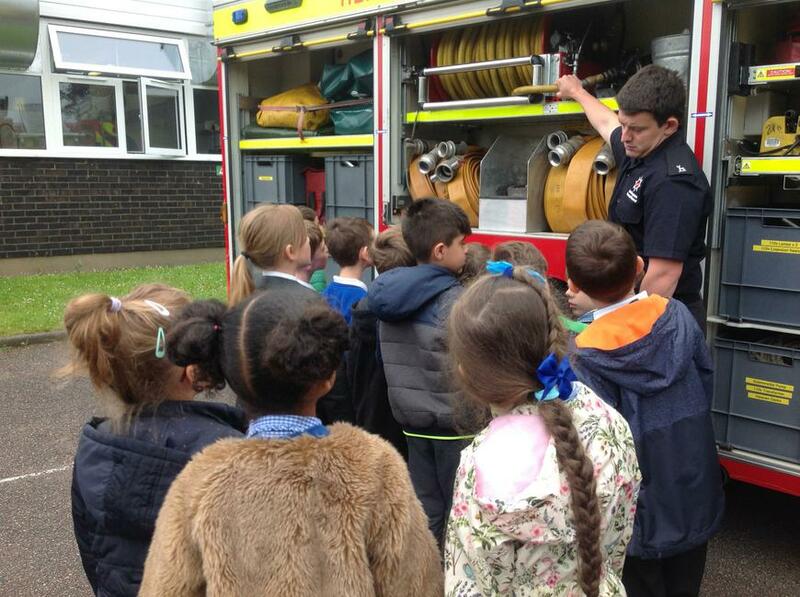 It made us think very carefully about the actual fire and the importance of being safe today. 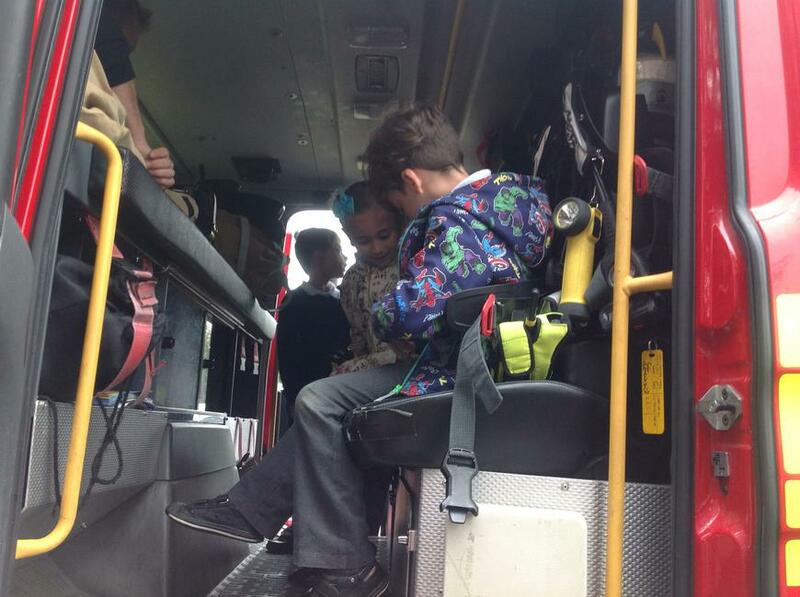 We know to call 999 if we see a fire and to make sure that we don't play with lighters or matches. 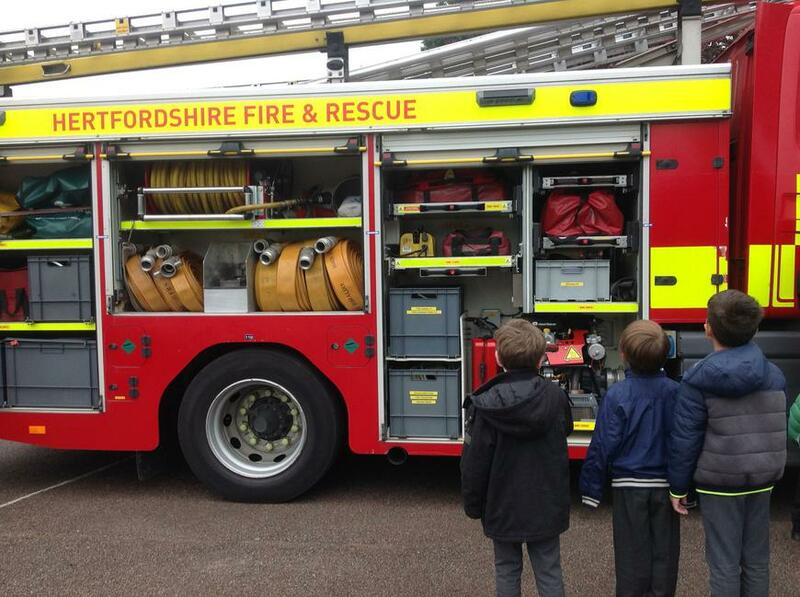 The fire crew then let us see the equipment on a modern fire engine. It was very different to the fire hooks and fire squirts they had in 1666. 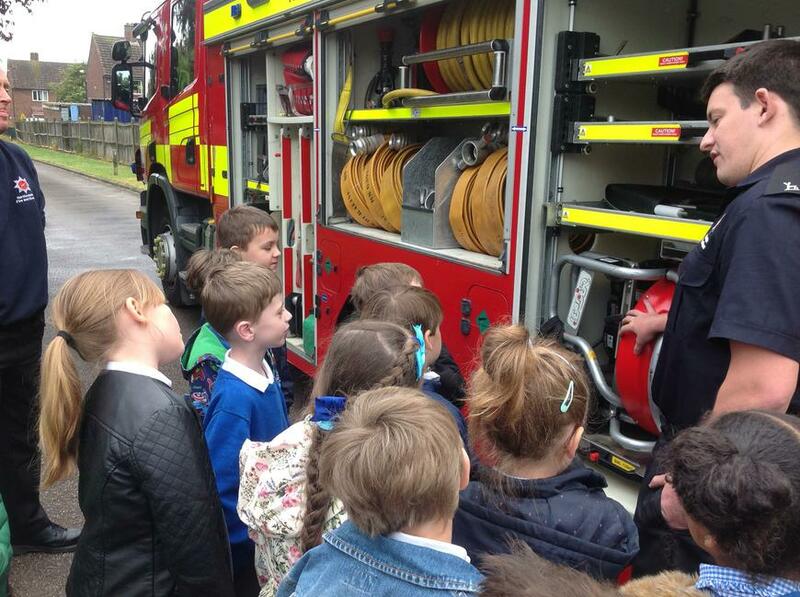 We loved the 3 different types of hose, 4 ladders, key and jaws to cut through metal! 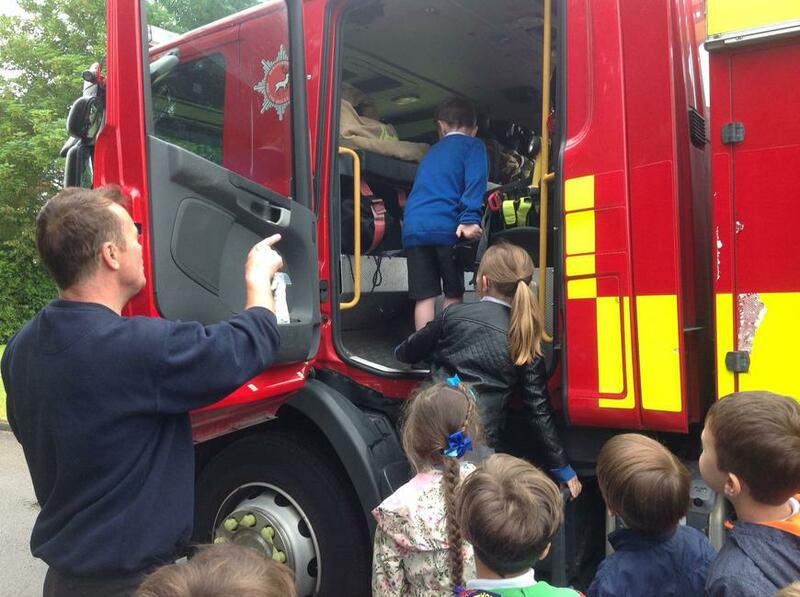 We were also given the opportunity to climb into the fire engine and see the special clothing that is worn to fight fires. A very interesting and inspiring morning was had by all. 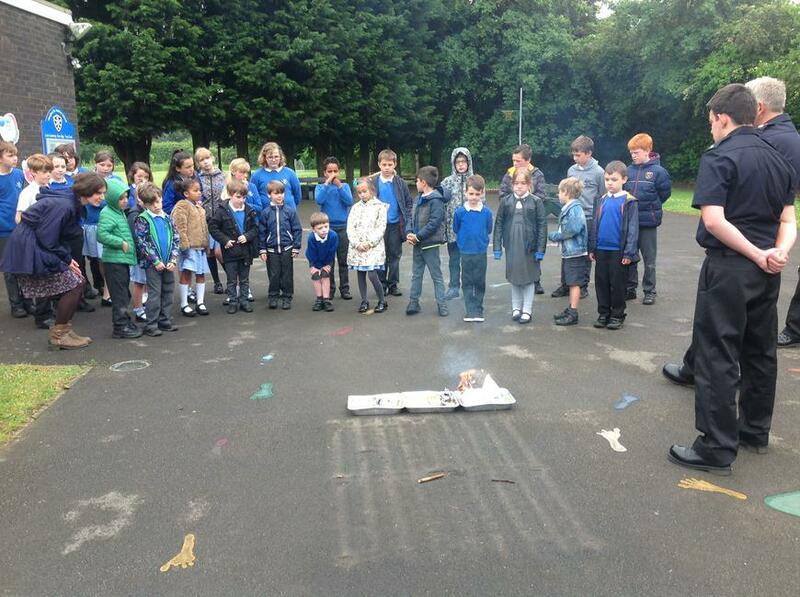 In music we have been exploring the Great Fire of London through songs and soundscapes. We used musical instruments to recreate the start of the fire, belongings being thrown into the River Thames and bird fluttering away with burning wings. On Friday afternoon we took part in an exciting multiskills festival at Wodson Park. We enjoyed practising our throwing, catching and agility skills, as well as developing our tennis. 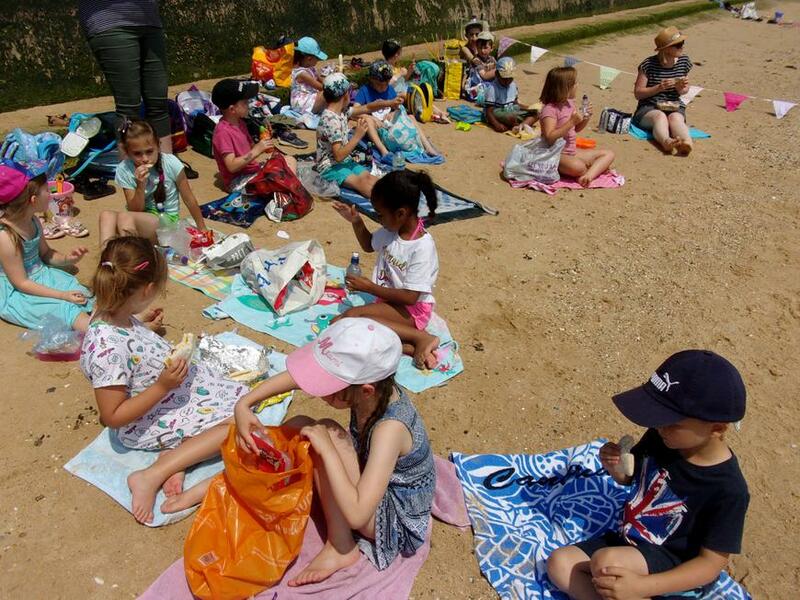 Thank you Mrs. Garbutt for organising such a fun afternoon out for us! When we returned to school on Monday, we wrote letters to our pen pals at Hertingfordbury Cowper to tell them all about it! In science we explored the issue of malaria by testing different netting materials to find the most effective to create mosquito nets. We were very creative with how we presented our results! On Tuesday 24th April we were joined by Andy from Legends Tennis. He taught us some super skills and how to stand to serve a tennis ball. 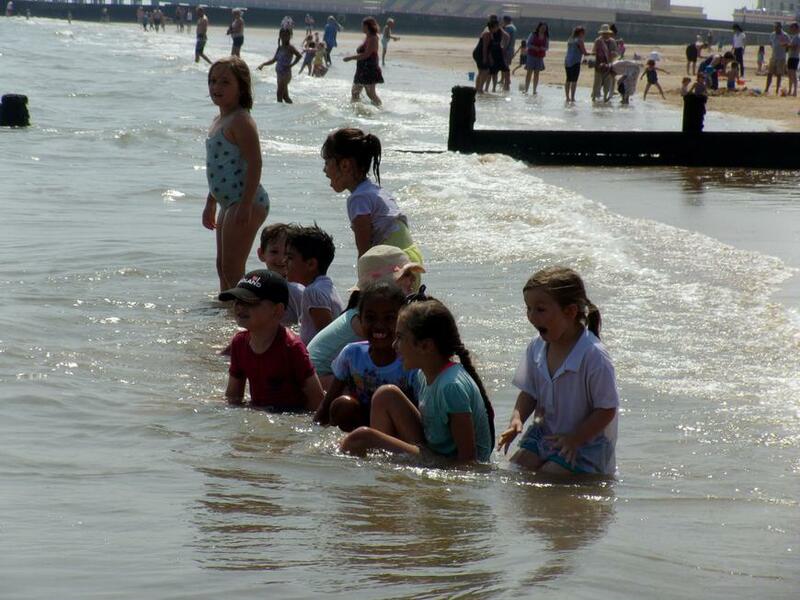 As you can see from the pictures, we all enjoyed ourselves! We were given certificates which let us have a free tennis taster session at his club. 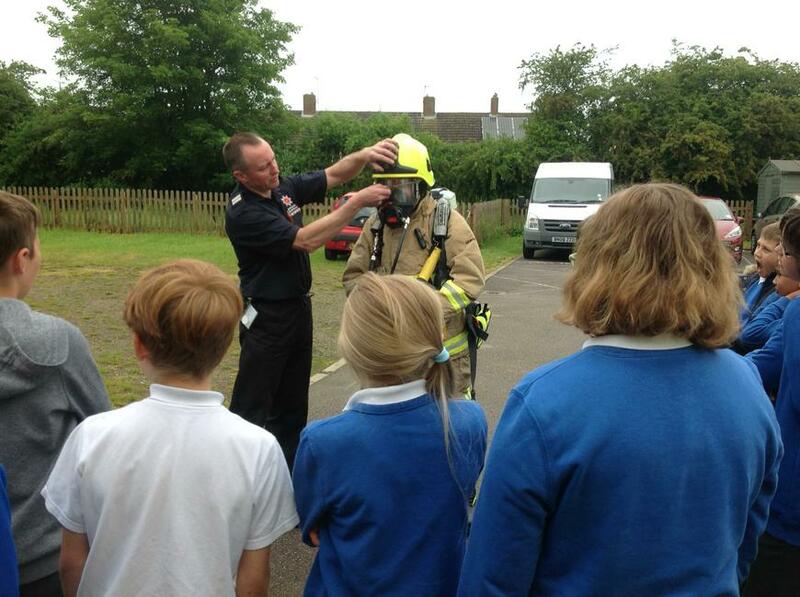 On 28th March 7 members of Y2 took part in an exciting Flight Day. 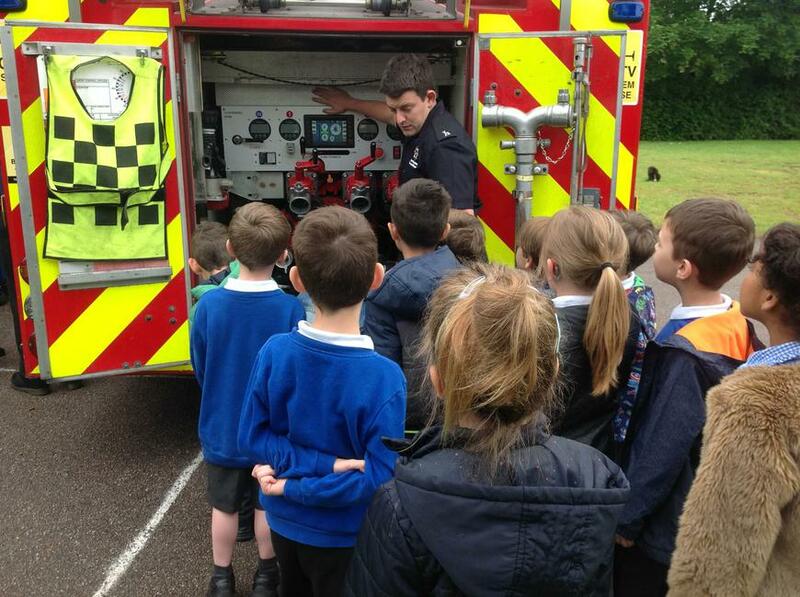 They were joined by 4 other primary schools to learn more about the science behind flying and aviation. The day began with a presentation about being a pilot from Robin, our STEM ambassador. 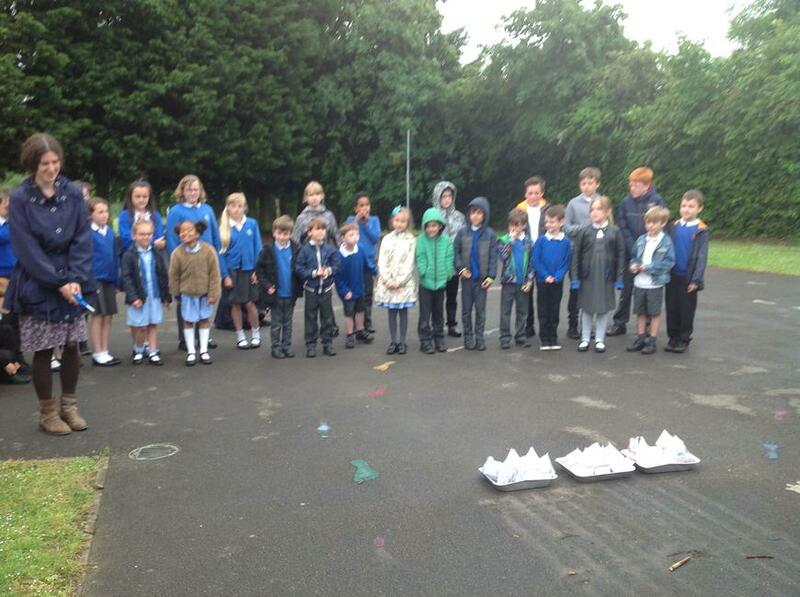 The children were then able to create their own gliders and paper aeroplanes. 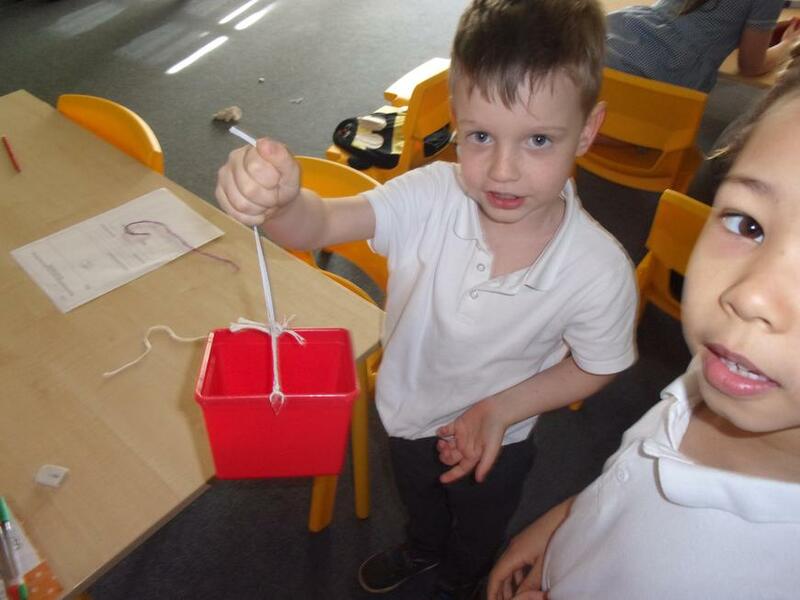 After learning about the features of an effective parachute, the children tested different materials to create their own. These were tested with great excitement in the hall! The morning ended with a hybrid competition. Robin told the children about fantastic flying machines which used a combination of technology to make them fly. Charlie, Maddox, Ayda, Harrison, Summer, Noah and Ellis designed a super flying machine with an engine, wings and propellers! Using the book 'The Day the Crayons Quit' the children created some fantastic letters and poems showing how the crayons felt. Today we celebrated International Women's Day. We began by thinking about the women in our lives who inspire us. Maddox - "Florence Nightingale inspires me because she made the hospitals clean". Noah - "My mum inspires me because she helps me and looks after me when I'm ill". 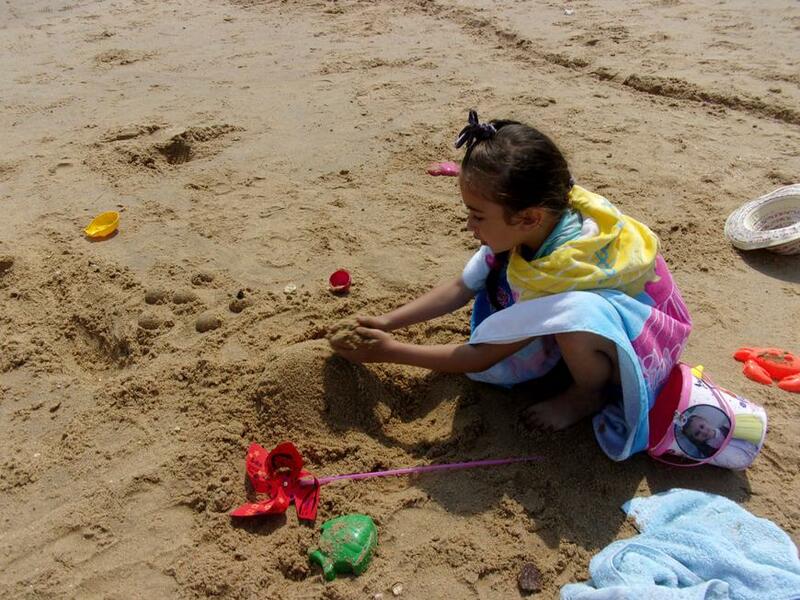 Summer - "My sister inspires me because she helps me with my homework". Ayda - "My dance teacher inspires me because she teaches me to be flexible". I then asked the children to imagine that their was a special event coming up and that everyone else in the school could have a vote, except Year 2! Laila - "I feel disappointed because we have ideas". Wojtek - "I feel sad because we have something to say". We used this activity as a starting point to learn about Emmeline Pankhurst and her campaign 'Votes for Women'. Finally, the children wrote messages of thanks for her achievements. We celebrated World Book Day by completing a book review of our favourite books and then presenting these to the rest of the class. 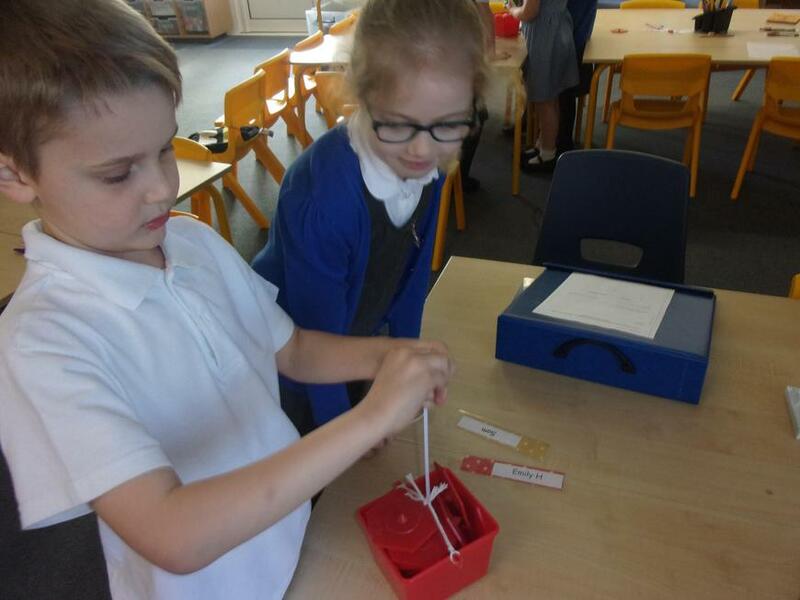 To extend their learning of materials and their properties, Year 2 wrote some clues for different toys. Can you guess the toy from the clue? To support Year 1 and 2 in their learning about how toys have changed, Mrs. Stark, Mrs. Caruana and Mr. Penrose spoke to the children about their favourite childhood toys. 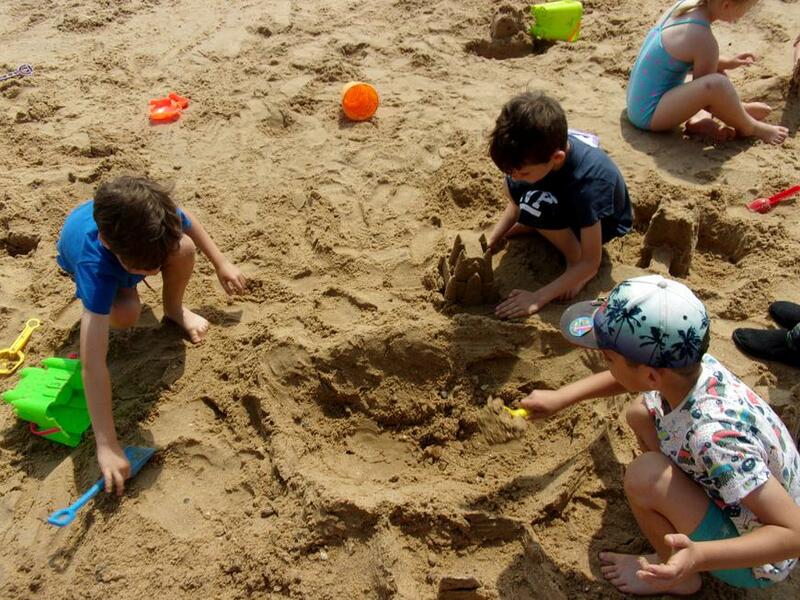 We learnt that Mr. Penrose made his own kites, Mrs. Stark built a model of her grandma's house out of LEGO and that Mrs. Caruana had a toy mouse that featured in all of her imaginary games! 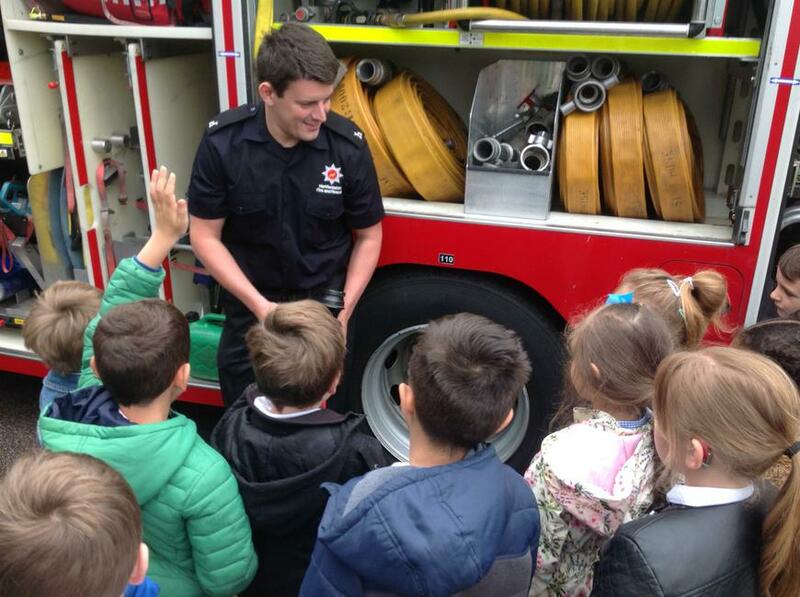 The children also asked some super questions. Year 2 have been applying their number bonds and place value knowledge to solve additions. They have 'rebalanced' a number to a multiple of 10 to make the amounts easier to add together. Today Year 1 and 2 learnt about how Christmas is celebrated in Italy. They completed a quiz, coloured pictures of the Christmas witch 'La Befana' and then tried some traditional panettone! Buon Natale! We have made anti-bullying promises to make sure that everyone in our school feels welcome, safe and respected. To prepare for our sponsored 1 mile walk we created water droplet friendship bracelets and flags. We have been learning all about the contribution of Florence Nightingale in the Crimean War. In science we tested materials to find the most effective for making the shade for her lantern, called a fanoos. As you can see, they work really well! On Friday 19th October we applied our understanding of different food groups and why humans need them to design and make our own delicious sandwiches. Each sandwich needed to have a fruit or vegetable as they contain vitamins and minerals to keep us healthy. We could then choose to add cheese (for strong bones and teeth) or chicken (protein to help us grow and fight diseases). As you can see, they were very tasty! On Monday 16th October Year 1 and 2 joined together to celebrate World Food Day, using the theme 'My Breakfast, Your Breakfast'. We began our day by looking at breakfasts eaten by four children around the world, and comparing them to our own. Next, we created food waste posters to help us think more carefully about how we can reduce the amount of food that goes in the bin at lunchtime. In the afternoon we thought about our GLP big issue "How can we make others feel welcome?" Caroline in Uganda didn't have any breakfast or lunch at school and Mouna in Mali had to pound the millet before she could eat it. Laila thought that if these girls came to our school we could give them some food, so we made some delicious breakfast rainbow fruit pots and cheese and fruit bagels that we would share with them. We ended our day with a thankfulness prayer and breakfast picnic. 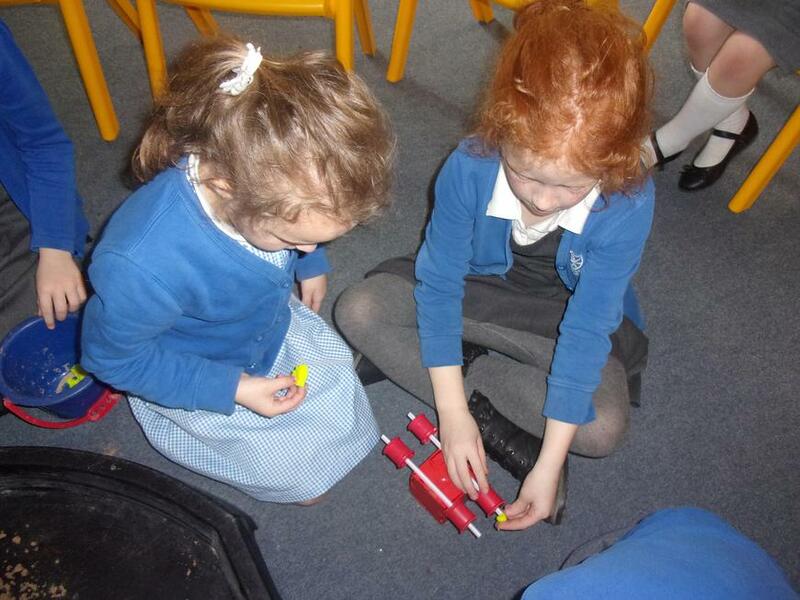 In computing we have been learning about programming Bee-bots. We are now designing our own local area maps so that we can create an algorithm to program the Bee-bot to travel from the Co-op shop to our school! 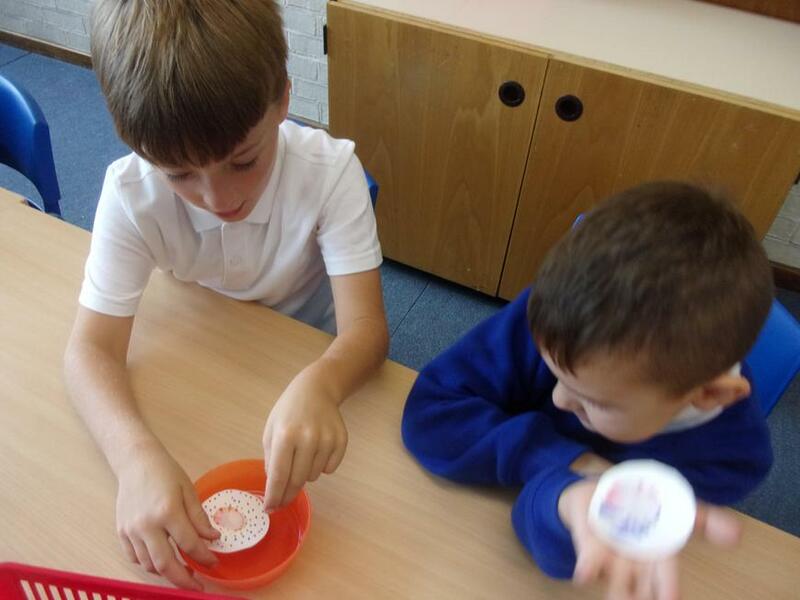 Thank you to all the mums and dads who came in on Friday 29th September to celebrate a morning of maths investigations. We all worked hard to find numbers to make 20, equivalence using pan balances, count dots, make numbers using different resources and see what happens when we add different combinations of odd and even numbers. We have started our investigative learning this week by looking at different ways to make 20. We used our knowledge of number bonds to 10 to help us and the Cuisenaire rods to present our findings. We are reading different versions of the fairy tale 'Rapunzel' at the moment, in particular the verison by Bethan Woolvin. Today we focused on what Rapunzel would see when she climbed down her incredibly long hair into the forest. We went for a senses walk in the nature area to help us, and then we wrote descriptive sentences using adjectives. 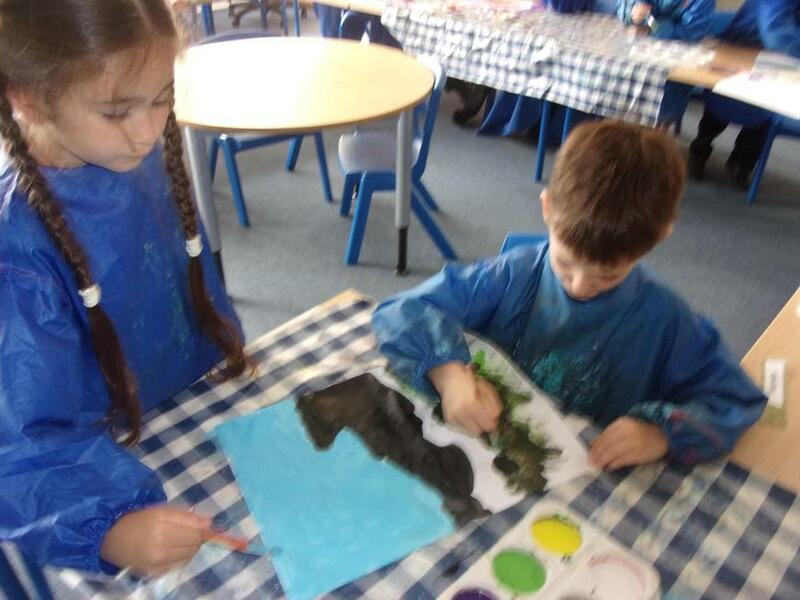 Year 2 began their learning this year by exploring Van Gogh's painting 'The Starry Night'. They used chromatograms to explore the different coloured dyes in felt-tip pens and used this knowledge to design their own beautiful stars for the class picture. Next they created larger stars using tissue paper and paper plates. 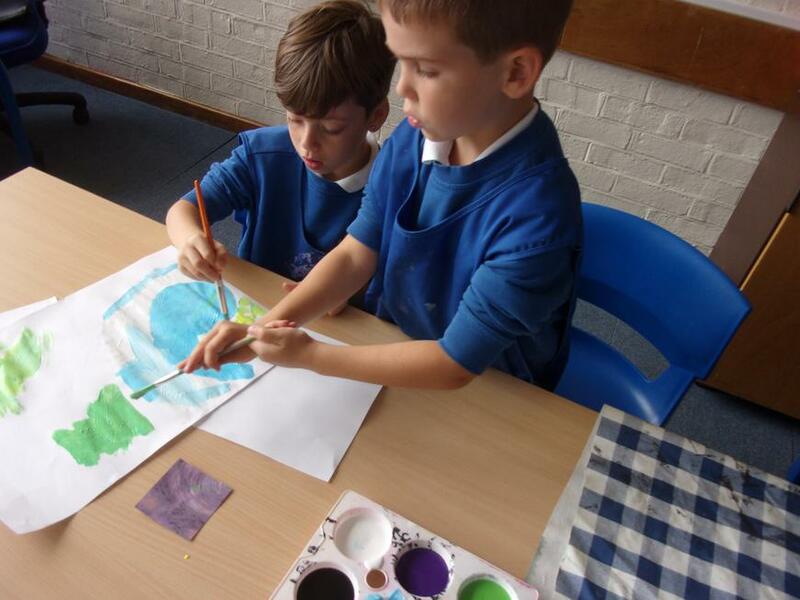 The children also looked carefully at how Van Gogh mixed and applied colours to create their own version of the painting and practised their cutting skills to make some sugar paper houses with illuminated windows. In computing we are learning to create branching databases using the '2Question' program. Congratualtions to Aimee, Harvey and Oskar who have all written short adventure stories and had them published in the Young Writers 'My First Story 2017' book. In maths we have been practising doubling numbers. We carried out an investigation to answer the questions 'When you double an even number, is the answer odd or even?' and 'When you double an odd number, is the answer odd or even?' We discovered that the answers are even! Do bigger fruits have bigger seeds? We carried out a pattern seeking enquiry to answer the question 'Does the biggest fruit have the biggest seeds?' We ordered the 4 fruits (papaya, apple, cherry and plum) and found the papaya was the biggest fruit. However, when Mrs. Caruana cut the fruits open, we discovered that the papaya had lots of little seeds. The biggest seed (or stone) was in the plum! Reverend Alan visited Year 2 to talk about his role as a religious leader and what he does in a typical week. He showed us the box of artefacts used for communion, along with a special cube to explain baptism. He talked to us about how oil is used to anoint people who are unwell. 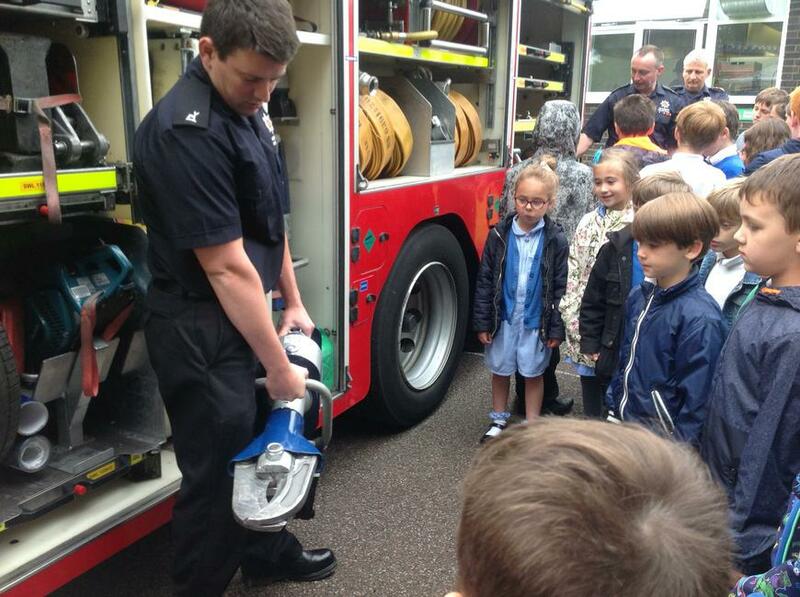 Then he shared the special clothing he wears for different services, including weddings and funerals. We were able to try the special bread, put the oil on our foreheads or dress up in the stoles and chasuble for Sunday services. 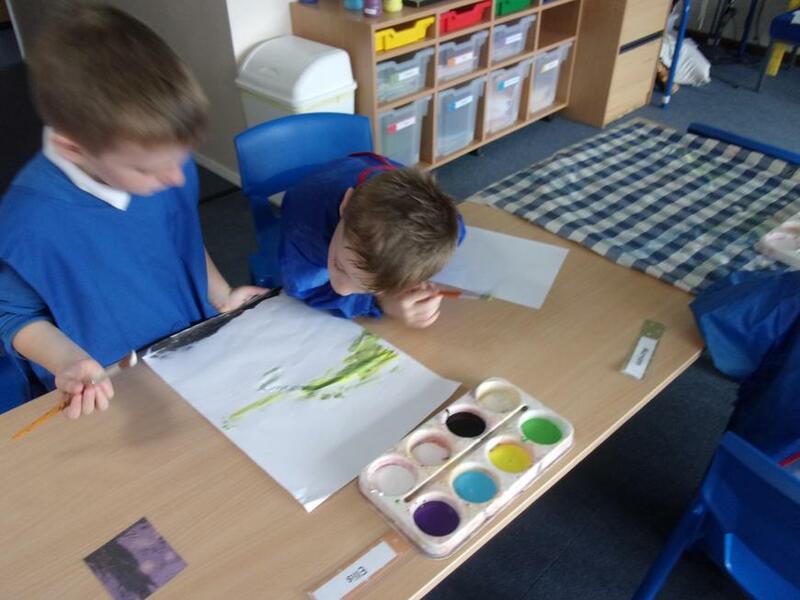 We have been sketching flowers with Mrs. Hodges ready to paint them in the style of Van Gogh. In Science we are exploring microhabitats and the minibeasts that live in them. We made predictions about what we would find in some leaf litter and the soil of a flower pot. 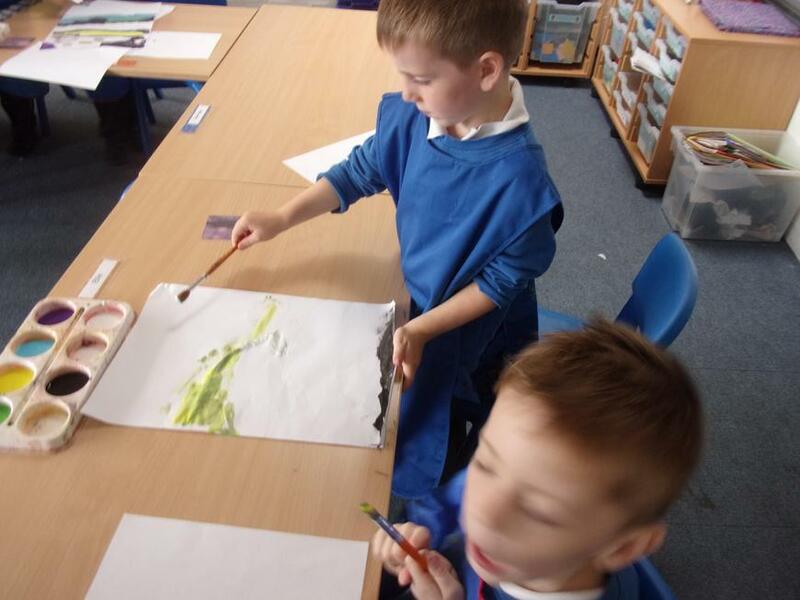 We used paintbrushes to look for minibeasts. We were surprised to find some little flies, spiders and green beetles! We decided that the beetles were green so that they could camouflage with the leaves. 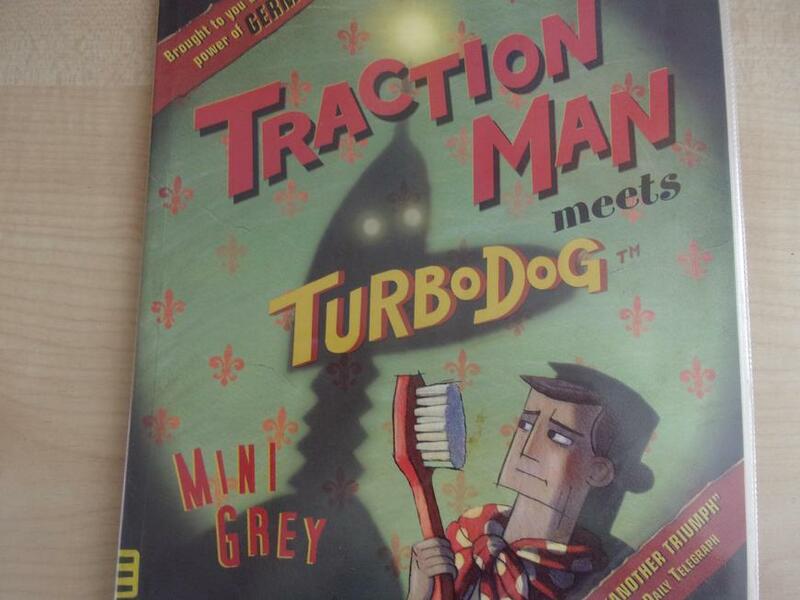 For Science Week (13th - 17th March) Year 2 carried out investigations linked to 'Traction Man meets Turbodog' by Mini Grey. 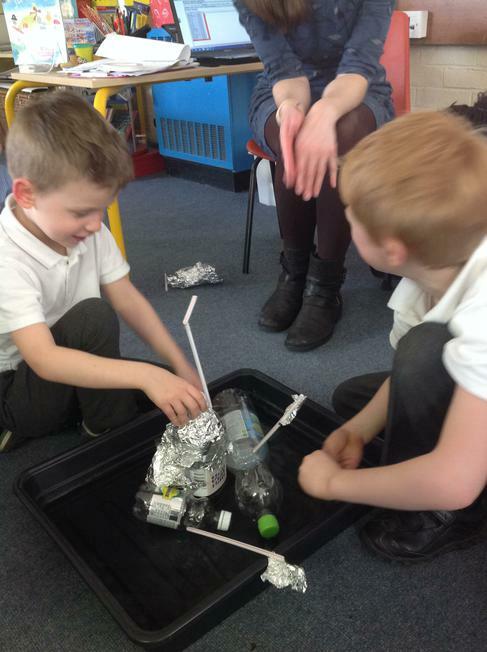 We began by exploring the strongest material for Traction Man to use as a rope to climb the compost heap. We tried to see if any of the materials would break, but they didn't! However, we did discover that the elastic stretched. 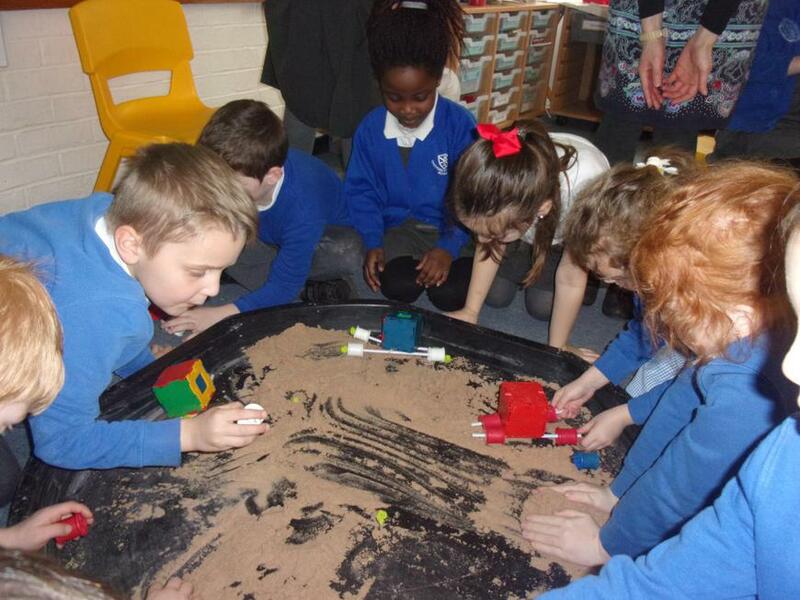 Next we investigated the best wheels for Turbodog to cross the sand pit. 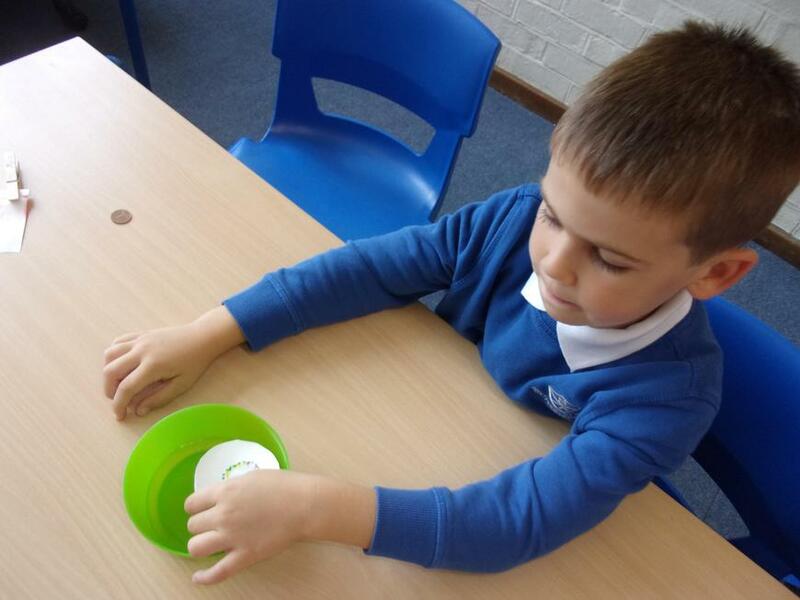 Year 2 tested cotton reels, plastic wheels and Play-Doh and decided that the most effective wheels were those that could turn easily. These were certainly not made from the Play Doh! 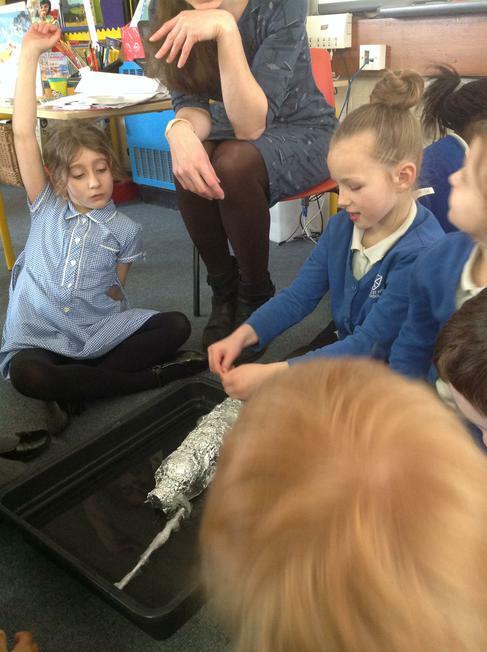 Finally, Year 2 designed and made a boat or submarine so that Tubodog could join Traction Man swimming in the bath tub. 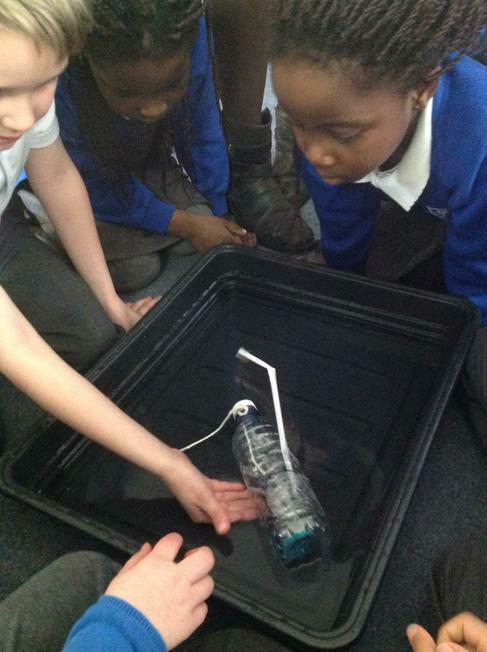 Testing our boats allowed us to make careful obsertvations and explain why some floated and others sunk. 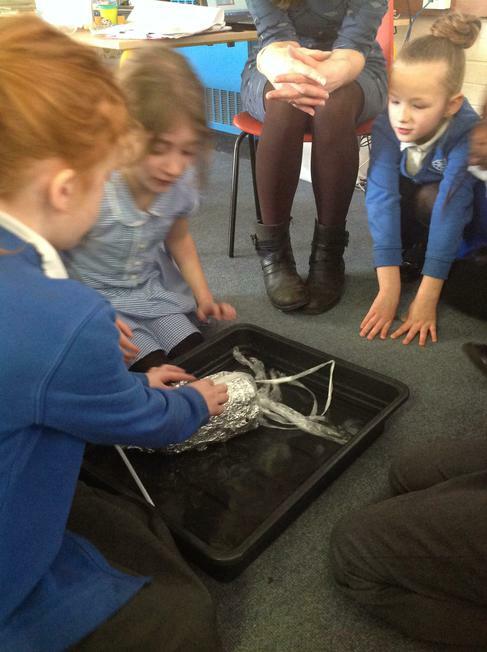 As you can see from the pictures, Year 2 really enjoyed their science week! On Thursday 2nd February we visited Hertford St Andrew Church. We have been learning about why churches are special places for Christians and looked at some of their features. When we arrived at the church we were greeted by Reverend Alan who invited us inside. We sat quietly for a little while before Reverend Alan told us about some of the church's features. We learnt it was built in the shape of a cross and that the roof looked like Noah's ark. He showed us the font and Lacey told us that it was used for baptising babies. We all enjoyed listening to the bell being rung! After Reverend Alan left we took it in turns carrying out different activites. 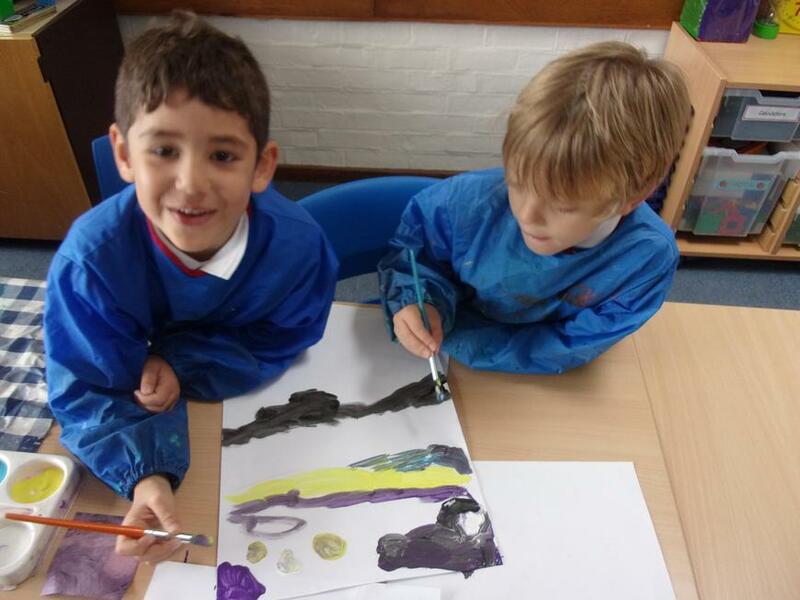 Sam and Aimee were super at spotting the different features from our treasure hunt clues, while Lijana and Oskar made some detailed sketches of different objects with Miss H. As you can see from the photograph, all enjoyed making stained glass windows with Miss Melville! We have been exploring famous people in history. 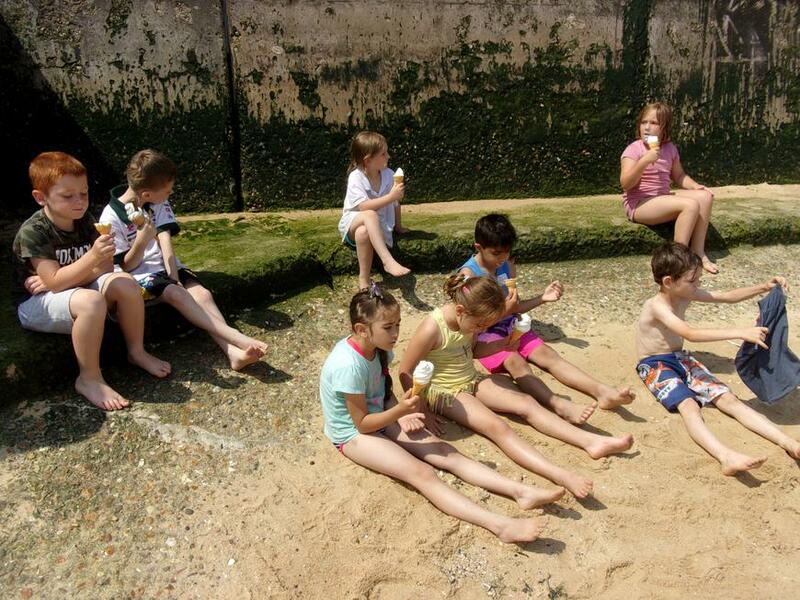 We learnt about Christopher Columbus and role-played different situations he faced as he discovered America. In RE we have been thinking about the role of the Wise Men in the Nativity story. We thought about the presents we would like to get and then 'invisible' gifts we would like to give to our family and world, such as love, kindness, friendship and forgiveness. Finally we used Play-Doh to make models of these gifts. For Anti-Bullying Week we have been thinking about how to use our 'power for good'. We designed anti-bullying superheroes after listening to the story 'The Bully and the Shrimp'. 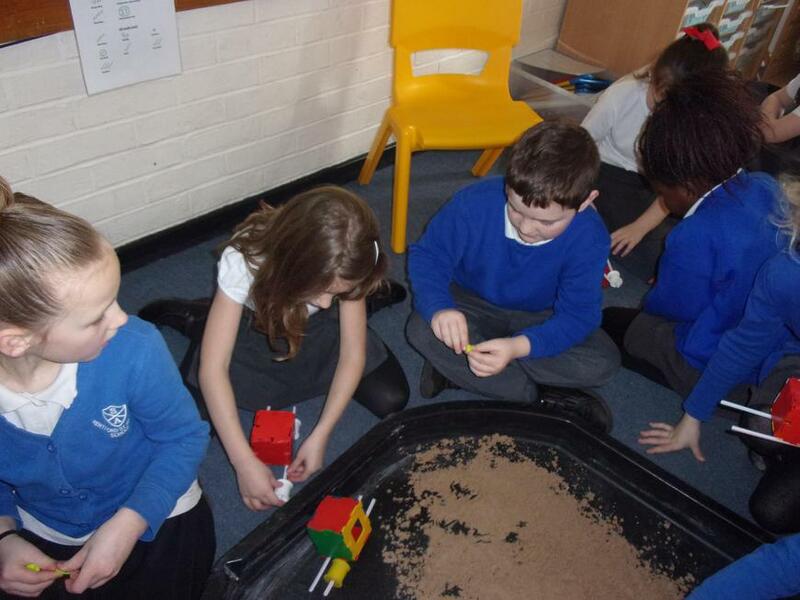 During Maths Investigation Week Year 2 focused on fractions. 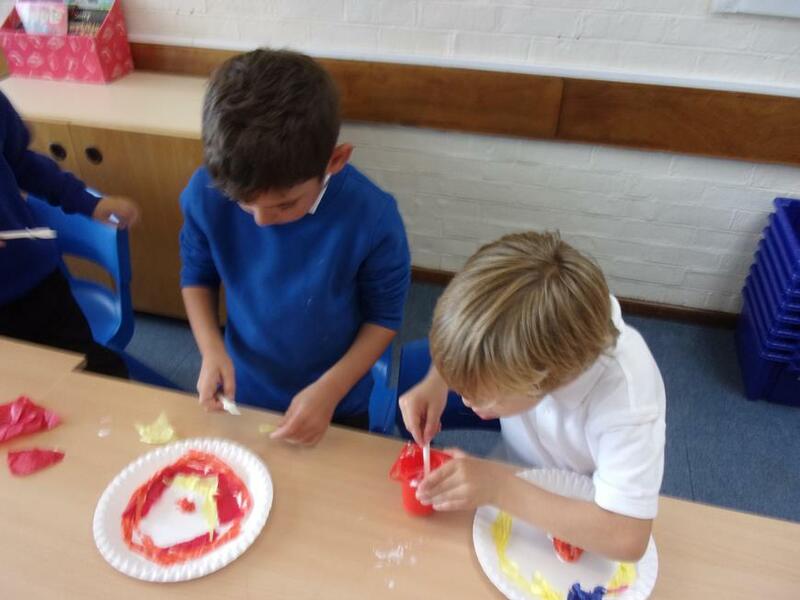 We used 'pizza toppings' to find a half and quarter of numbers and explored halving odd numbers using Play-Doh. On Friday the children invited their parents into class to share what they had learnt. On Monday 10th October Year 2 took part in the KS1 Infant Agility Festival at Wodson Park. 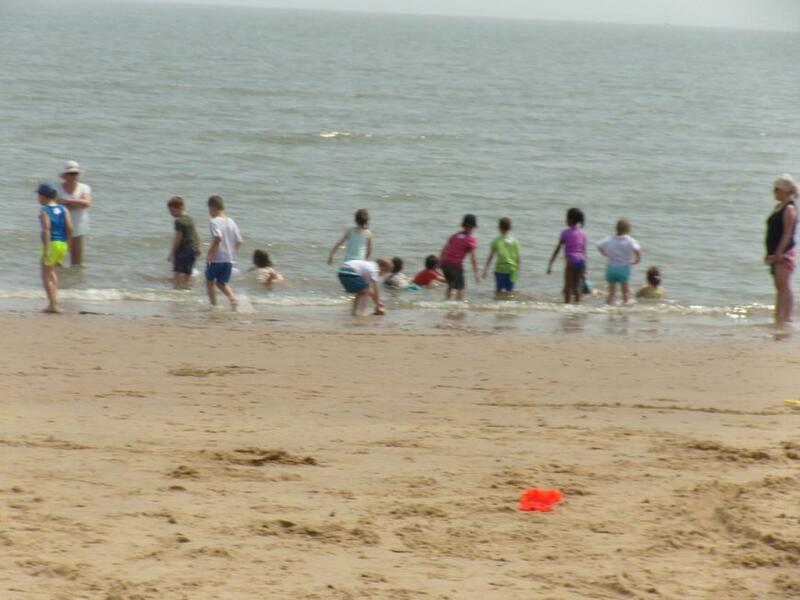 We had a brilliant time skipping, throwing, balancing, jumping and running! 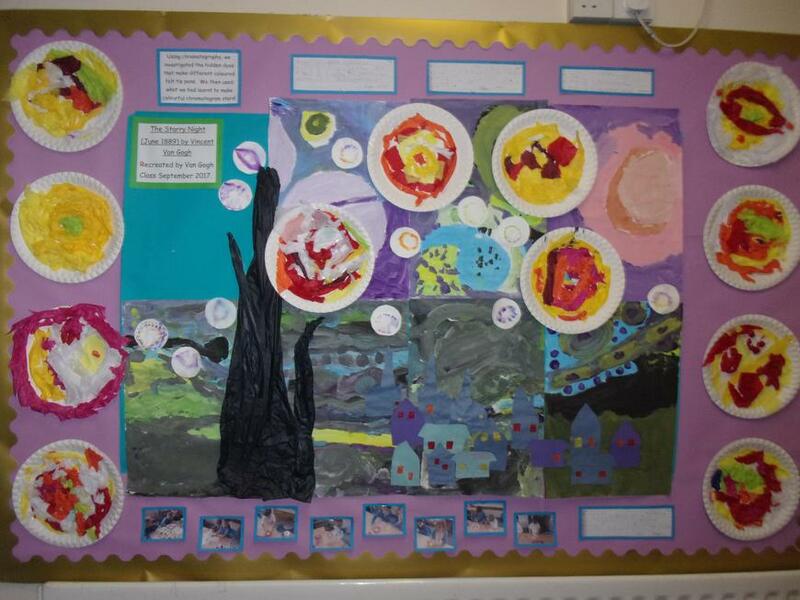 Year 2's fantastic art inspired by Van Gogh's 'The Sunflowers' for 'Take One Picture' week.